Just in: Loggerheads top nest record again! For the fourth straight year, Georgia has hit a new high in loggerhead sea turtle nests. Sea Turtle Program Coordinator Mark Dodd of the Georgia Department of Natural Resources said this morning that 2,142 nests have been documented so far this summer, topping last year's record of 2,141. That marks only the second time the federally threatened reptile has laid more than 2,000 nests on state beaches since comprehensive surveys began in 1989. Counts have also climbed steadily since 2009, the longest span in 25 years and an encouraging change from the usual ups and downs in loggerhead nesting. Analysis last year showed that the increasing trend is statistically significant. He credits a wide range of conservation measures, plus the efforts of the Georgia Sea Turtle Cooperative, a network of volunteers, researchers and agency employees who patrol barrier island beaches daily during the sea turtle nesting season, protecting and managing sea turtle nests. Dodd cautions that the current run has not reached federal recovery benchmarks: a 2 percent annual increase for 50 years resulting in a statewide total of 2,800 loggerhead nests a year. But he’s excited about the upward swing, particularly after a slow start to the nesting season had some turtle watchers thinking 2013 might be a down year for loggerheads. See photos from this nesting season! About 23 percent of Georgia's loggerhead hatchlings this year have dug out of their sand nests and headed toward the surf. Dodd said that two major factors affect hatching success: predation, mainly by feral hogs and raccoons, and tropical storms. The Sea Turtle Cooperative works to limit nest predation. And so far this year, Georgia has escaped major storms and the tide surges they bring. Hatching season runs from July through mid-September in Georgia. Loggerheads nest from Virginia to Texas. Hatch and nest updates. What your teacher learned during the last school year, you may use this year to learn about wildlife. 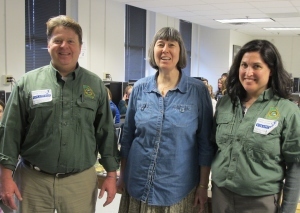 For three days in March, Gast’s science students were among some 300 Oconee County Middle School seventh-graders who were taught about key natural history websites by Dr. Mincy Moffett and Anna Yellin of the DNR Wildlife Resources Division. Gast plans to put some of the insights gleaned to work this year. “A lot of the databases I wasn’t aware of,” she said. The program held in the school’s computer lab delved into three websites – Wildlife Resources’ rare animals and plants data (see Rare wildlife: part I), NatureServe Explorer and the Convention on International Trade of Endangered Species of Wild Fauna and Flora. The scale moves from local to national to international, shifting from DNR county-level information on 1,425 animal and plant species to NatureServe’s focus on species in North America, Latin America and the Caribbean to the more than 34,000 species that CITES tracks to help stem exploitation through international trade. Moffett, a botanist with Wildlife Resources’ Nongame Conservation Section, and Yellin, the agency’s environmental review coordinator, used hands-on lessons to explain the sites and how to use them for research. Yellin followed with a look at citizen science opportunities (details in the next Georgia Wild). Gast said the focus fit the taxonomy unit her life sciences students were studying “perfectly.” But from her perspective, there’s much more here, for students and educators. Teachers and parents who would like to learn more can email Mincy Moffett or Anna Yellin. This is the second in a series on educational conservation information and efforts. Part I profiled local rare species and natural community data the Wildlife Resources Division provides. Part III will explore citizen science opportunities for putting web-based information into action. Comments? Questions? Send ’em! In nature, beauty is often as fragile as it is short-lived. Such is the case with eastern tiger swallowtail butterflies. These large, gossamer-winged insects are so gorgeous they capture our attention whenever we see them. But adult tiger swallowtails have a life span measured only in days. They fly about our yards for no more than about two weeks – a brief period during which they must feed and produce a new generation of swallowtails. Read Terry’s complete column to learn how tiger swallowtails win this race against time. Also learn where they lay their eggs, how to tell females from males and how their caterpillars defend themselves (hint: think bird droppings and eyespots). 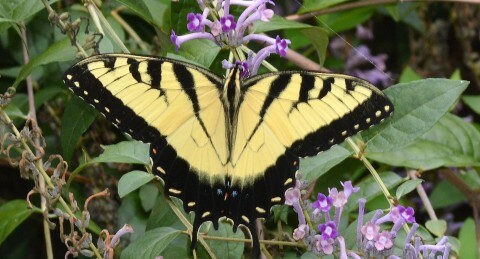 At the urging of the Garden Club of Georgia, state legislators named the eastern tiger swallowtail Georgia’s state butterfly in 1988. This offer will suit you to a T.
Georgia Wild subscribers who take our newsletter survey can be in the running for one of five free eagle tag T-shirts. The survey will help us gauge how effective Georgia Wild is. 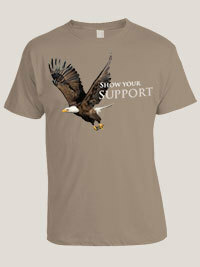 The new T’s will help you look as sharp as, well, an eagle’s talon. Next month, we’ll draw the names of five survey participants and send them a T-shirt sized to fit. So don’t wait: Give us your thoughts on Georgia Wild today! Then email us to put your name in the hat for a wild T-shirt. An invasive insect that has caused the death or decline of millions of ash trees in 20 states has been found in Georgia. According to the U.S. Department of Agriculture, survey traps caught emerald ash borer beetles in DeKalb and Fulton counties last month, setting in motion plans led by the Georgia Invasive Species Task Force to prevent its spread and raise public awareness about the threat. Forest health alerts. Continuing to blaze a trail, Georgia’s Interagency Burn Team applied prescribed fire to help restore and manage fire-adapted habitats on nearly 59,000 acres during the last 12 months. The team includes DNR and other state agencies, federal agencies such as the Forest Service and Fish and Wildlife Service, and private partners including The Nature Conservancy and The Longleaf Alliance. More in the Nongame Conservation Section's annual report. For a look of prescribed fire’s impact, watch The Nature Conservancy’s time-lapse video that documents regrowth after a burn at Moody Forest Wildlife Management Area near Baxley. American white pelicans are becoming more common on the Georgia coast as the stunning bird with wing spans topping 9 feet expands east. 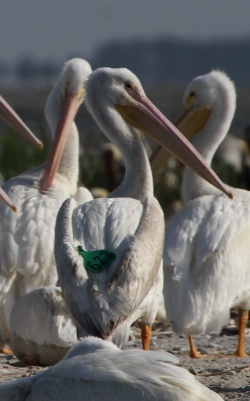 While most of the white pelicans seen here can be traced to Minnesota breeding colonies (such as the tagged bird at left), DNR biologist Tim Keyes spotted one this spring that had been hatched in Idaho, the first white pelican documented in Georgia from the Pacific Flyway. Read his Georgia Birders Online post. A U.S. House subcommittee’s proposal to cut all funding for the State & Tribal Wildlife Grants Program and other initiatives like the North American Wetland Conservation Fund has roused program supporters. The coalition Teaming with Wildlife is circulating a sign-on letter opposing what it calls “unprecedented” cuts. State Wildlife Grants provide crucial funding for Georgia and other states to conserve nongame wildlife. The whorled sunflower, documented only in Georgia’s Floyd County, a county in Alabama and two in Tennessee, is one of three plants the Fish and Wildlife Service recently proposed listing as endangered under the Endangered Species Act. The perennial sunflower, named for the whorls of leaves the middle of its tall stems, is found in moist prairie habitats. The Gopher Tortoise Council has opened registration and put out a call for abstracts for its 35th annual conference, set for Oct. 10-13 in Ponte Vedra Beach, Fla. Formed in 1978 over concerns about the decline of gopher tortoises, the council focuses on management, conservation and protection of this and other upland species in the Southeast. The most recent Tortoise Burrow, the council’s newsletter, profiles striped newt repatriation work at Apalachicola National Forest. The project is tied to Georgia’s Fall Line Sandhills Wildlife Management Area (“Fall Line powers projects,” May 2011), the sole reliable site for “western” striped newts. Download a copy. Two male timber rattlesnakes in combat at Dawson Forest Wildlife Management Area near Dawsonville recently caught the eye of DNR wildlife technician Jim Johnson. Here’s what he saw. Genetic research tracking mother loggerhead sea turtles in Georgia and South Carolina is funded by a new, $1.6 million NOAA Fisheries grant. South Carolina also received a separate $825,000 grant – one of 13 proposals picked – to fill in data gaps in how Atlantic sturgeon use habitat off the coast of that state and Georgia. Details. A recovery plan for Alabama sturgeon, federally endangered and found only in the Mobile River basin, focuses on establishing a captive brood stock, producing fingerlings to boost wild populations and changing lock and dam operations to improve habitat in the Alabama River. The U.S. Fish and Wildlife Service recently announced the plan. Outdoor learning, from preschool to high school, is the theme of this year’s Outdoor Learning Symposium by the Environmental Education Alliance of Georgia. 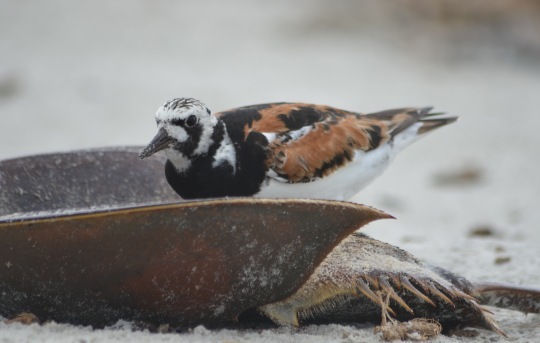 The symposium is Oct. 4 at Oatland Island Wildlife Center in Savannah. Traces of the fungus that causes white-nose syndrome have been detected in two north Arkansas caves. More recently, bats infected with the disease, which has decimated bat populations in the eastern U.S. and Canada, were found in caves at two Minnesota state parks. White-nose was first documented in Georgia earlier this year ("Disease found in Georgia," March 22). Names in the news: Mark Whitney has been promoted from DNR Wildlife Resources Division Game Management Section chief to assistant director of the division. John Bowers, former Game Management assistant chief, has been named the section chief. Brian Millsap, a former leader in nongame conservation in Florida and now national raptor coordinator for the U.S. Fish and Wildlife Service, has received the federal agency’s Ira Gabrielson Conservation Leadership Award (video). on the East Coast. DNR is participating for the first time this year.